In order to take the next step towards commercial deployment, we’ve initiated discussions with technology suppliers to start testing and building commercial-grade Project AirGig equipment. We’re also exploring another field trial in which we’ll focus on aspects of surface-wave systems, which could provide an important ingredient in a future 5G world. This is an important next step to scale Project AirGig and bring this technology to many more people and businesses across the country. With 5G around the corner, timing couldn’t be better. We think Project AirGig and 5G have a lot of natural synergies, and we plan to test 5G paired with AirGig in the future. While we don’t have a date for commercial deployment of AirGig just yet, we’re moving closer to that moment every day. Next year, we’ll look to expand field trials with our technology supplier with a goal of eventually making gigabit-speed internet as widespread as electricity. Last year, we launched a trial of Project AirGig technology in Georgia with Georgia Power and have been encouraged by the results. In that trial, we provided a fixed wireless application to a number of participating homes. It used a combination of mmWave and LTE spectrum. We used plastic antenna prototypes installed along the utility poles and observed no degradation of the mmWave signals during rain and other weather events. We provided a system which delivered hundreds of megabits per second to a number of residential locations in a rural part of the state. We think these speeds could eventually reach the gigabit range in commercial deployments. 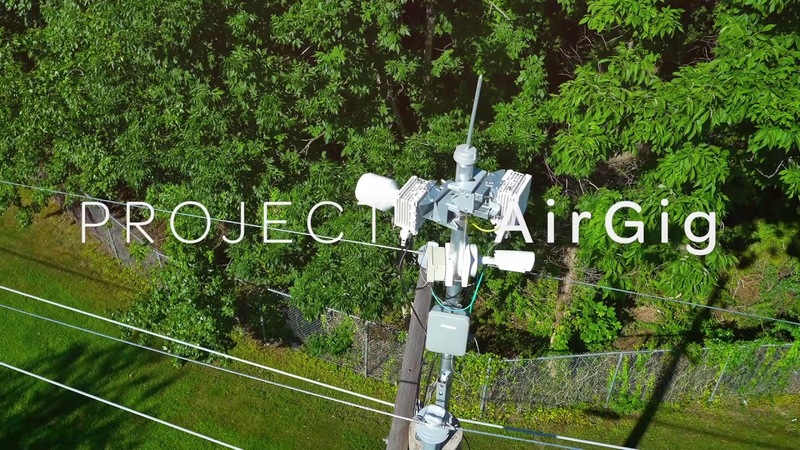 These initial results are encouraging for our AirGig R&D team and showed us how this technology can potentially be deployed in suburban and rural neighborhoods on a commercial scale. It was also encouraging for Georgia Power. High speed internet has become nearly as essential to modern life as electricity. We push buttons on our phones and a car shows up. Anything we want is a click away. We can get degrees online. However, unlike electricity, high speed internet is still not available to everyone. Nearly a third of the country lacks high-speed or broadband internet access. Enter Project AirGig. AT&T Labs invented items like low-cost plastic antennas, a radio distributed antenna system (RDAS), mmWave surface wave launchers and inductive power devices. The RDAS reconstructs signals for multi-gigabit mobile and fixed deployments. With the RDAS, we found a system design to effectively deliver not just broadband, but also mobile traffic. The mmWave surface wave launchers can power themselves via inductive power devices without a direct electrical connection. These devices then create a high-speed signal that travels along or near the wire – not through it. This signal means connected experiences become an everyday reality for more people – even in locations considered difficult to serve before the advent of Project AirGig.